One of the critical factors in delivering a great overall experience in Power BI is performance. As creators, you want your dashboard to load fast and provide quick insights to your customers. To aid this process, we added a feature called Performance Inspector in the Power BI service that helps you inspect and diagnose why the loading time is poor. You'll see alerts that identify the potential issue and suggest a fix. Give it a try by simply navigating to any dashboard that you have edit permissions to, opening the ellipsis menu, and choosing Performance Inspector. We shipped a new, enhanced version of the On-premises data gateway (personal mode). New features in this release include: an improved Fast Combine experience, ability to delete the gateway from the Power BI portal, export logs functionality, and enhanced overall reliability and performance. Install the new gateway. Documentation on the new gateway, how to install it, and list of FAQs can be found here. Let us know in this forum thread if you have any feedback or questions! In February, we added support for Power BI Q&A on mobile devices. This allowed you to ask questions and get answers in the form of interactive visuals that you could then explore. In July, we took it a step further by introducing the new Q&A experience on iOS. The new Q&A experience on mobile was developed in collaboration with the Microsoft Research team to showcase powerful technologies within our product. 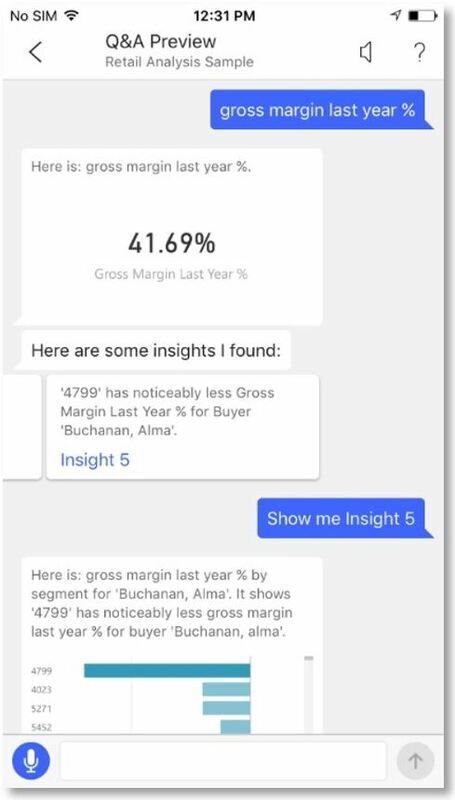 Instead of just receiving an answer to your question, you can now use natural language to get scoped insights. In cases where you are unsure what you are looking for, Q&A proactively surfaces insights relevant to your data. These insights are driven by a set of advanced analytics solutions that get executed when a question is asked. The improved Q&A also remembers the context of the conversation and can answer any follow-up question based on what you previously asked. With this, you can easily compare, filter, and replace fields or measures to your liking. Sound cool yet? 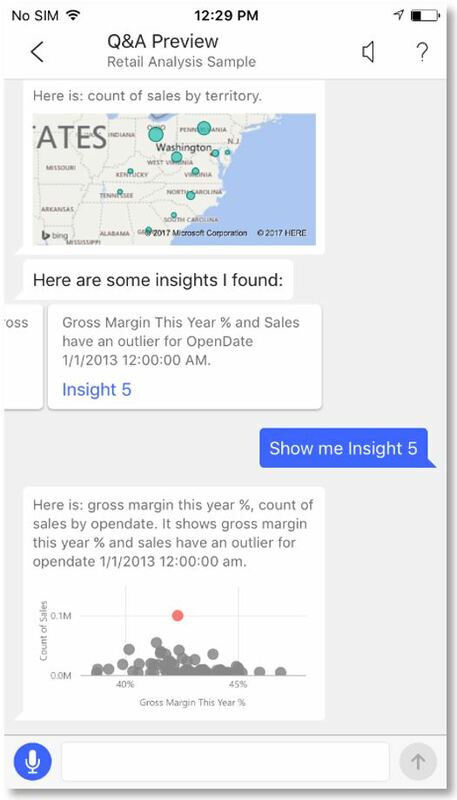 Well, you can even use conversational words when talking about data such as “How about” or “Compare it”. 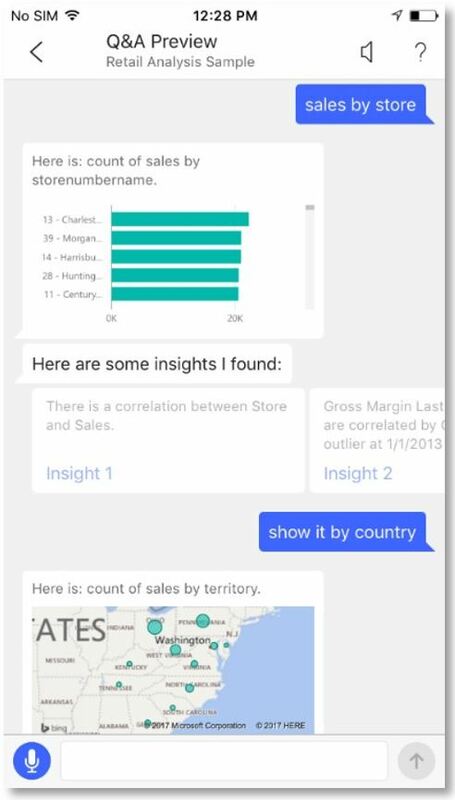 On your iPhone or iPad, open the Power BI app and navigate to the Retail Analysis Sample dashboard. Tap the Q&A icon from the action menu at the bottom of the page. Note: If you can’t see this icon in the dashboard it is because the dashboard owner didn’t enable Q&A feature on this dashboard. Use the suggestions to get started. For example, you can choose ‘featured insights’ to find insights on all the underlying data in your dashboard. See our documentation for a full view of present and past updates in service and mobile. 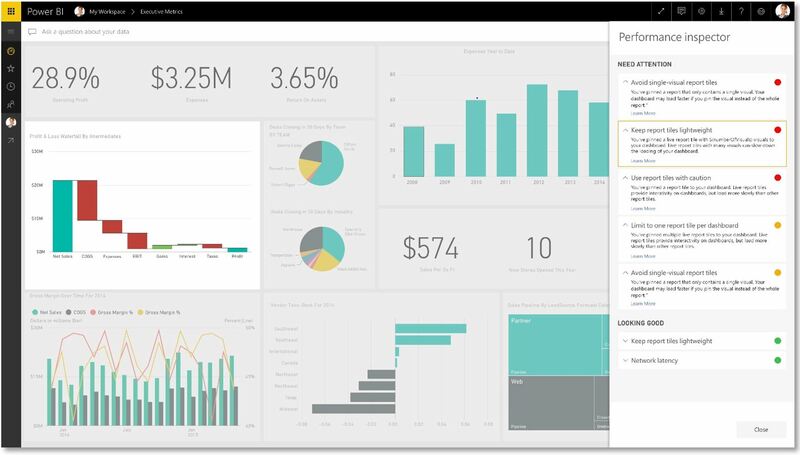 For a more detailed walkthrough of what we released last month, check out the Power BI Service and Mobile June Feature Summary.